Jacinto Benavente. Benavente y Martinez, Jacinto, photograph. The Library of Congress. Jacinto Benavente, the author of more than 170 plays, dominated the Spanish stage for half a century. He achieved fame and official recognition in his long career and won the Nobel Prize for Literature in 1922. His work is best known for its comic satire, aimed largely at the decadent upper and aristocratic classes of Madrid. Early Love of the Theater. 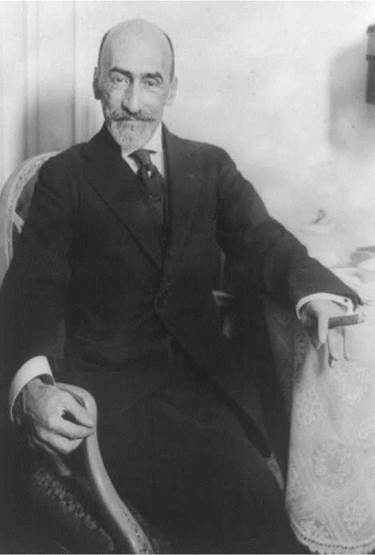 Jacinto Benavente y Martinez was born in Madrid on August 12, 1866. He was the youngest child of Venancia Martinez and Mariano Benavente, a respected doctor who was considered a pioneer in the field of pediatric medicine in Spain. The couple, who had three sons, enjoyed a privileged place in Madrid society because of the doctor’s reputation. The family had the opportunity to attend premieres and go to the theater regularly. Benavente was a theatergoer at an early age. He also learned to read at home at the age of five and soon was reading plays by both Spanish and foreign authors, especially Shakespeare, whom his father admired greatly. Because the young man studied French, English, Italian, and some Latin in his high school years, he was able to read many plays in their original languages. During his childhood and into his early teenage years, he built several toy theaters and performed puppet shows for his friends and neighbors and the household staff. Discouraged from Acting. Besides producing original plays, the young Benavente memorized and often recited scenes from classic and contemporary authors, including Moliere, Friedrich Schiller, Shakespeare, and the Spanish playwrights Lope de Vega, Pedro Calderon de la Barca, and Jose Zorrilla. Benavente’s father was concerned that his youngest son spent too much time and energy rehearsing and performing plays instead of studying, so he told him to stop these activities. Benavente was disappointed, since he hoped to be an actor. He was so affected by his father’s decision that he became depressed and later wrote that he considered this depression the end of his childhood. His father wanted him to become an engineer and convinced him that he should attend college. He enrolled in the University of Madrid in 1882, but when his father died in 1885, he dropped out of college without hesitation and devoted himself to reading, writing, and traveling abroad between 1885 and 1892. Benavente also attended the literary gatherings at the Cafe Iberia and spent his time writing comedies and poems at home and reading the classics and contemporary works. One of Benavente’s older brothers, Mariano, encouraged him to continue writing. Undisclosed Private Life. Benavente had a close relationship with his mother, with whom he lived as an adult until her death in 1922. It appears that he never had a significant emotional relationship with anyone else, priding himself on being a confirmed bachelor. Critics have wondered about the fact that there is so little available information about the private life of such a famous writer. Persistent but unconfirmed rumors, particularly in theatrical circles, alleged that Benavente had homosexual leanings. When he was told about rumors regarding his ‘‘certain physiological anomalies,’’ the writer simply shrugged; he also ignored malicious whisperings about his sexual orientation. Avoiding curious critics, Benavente focused on his writing, publishing Fantasy Theatre, a compilation of unproduced short plays, in 1892. The edition included Spring Story, The Magic of an Hour, Artist’s Love, and The Favorites. The latter was produced in Seville in 1903. The Magic of an Hour was produced in Madrid in 1905. The other two plays have never been performed. An Actor at Last. In 1893 Benavente expanded his literary output and published three books: The Down of the Thistle; Verses; and Women’s Letters. Women’s Letters became a commercial success and was also praised by critics; yet the poems in Verses were considered mediocre, even by the author himself. He never published another poetry book during his lifetime, although more than one hundred poems, found among his papers, appeared posthumously in the appendix to volume ten of the Complete Works (1942-1958). His experiences with the stage were far more important for his future career: in 1890 he finally realized his lifelong dream and joined the Maria Tubeau theater company as an actor. In 1894 he produced Another’s Nest, which most scholars consider the beginning of his career as a dramatist. Benavente had tried to convince a family friend, Emilio Mario, who was the respected impresario of Comedy Theatre in Madrid, to perform the play, and for years had brought Mario over a dozen plays until Mario finally accepted Another’s Nest. It premiered on October 6, 1894, but was a resounding failure. The majority of critics wrote negative reviews—most attributing the play’s failure to the loud complaints against its alleged immorality. This undoubtedly affected young Benavente and forced him to be more cautious in his criticism of society’s values. From then on, his theater was a balancing act: his subsequent plays offered social satire as long as it could be tolerated by the middle-class audience that filled the theaters at the time. Overwhelming Success. Two years after the brief disastrous run of Another’s Nest, Benavente managed to convince the theater company of Cobena and Thuiller to give him another chance with his comedy People of Importance. The play premiered in 1896, and the public liked the sharp, witty dialogue and the contemporary situations it presented. It was his first success, to be followed by many more—including The Tellez Woman’s Husband (1897), A Lady (1908), and The Passion Flower (1913). By the time A Lady was produced, he was the most sought-after playwright in Spain. He was still in his early forties and had already produced more than fifty plays. Besides contributing to several literary and dramatic journals, in 1899 he was involved in the establishing of Artistic Theatre—an attempt to bring to the Spanish public alternative plays, productions different from those usually seen in the commercial theaters. In 1909 Benavente founded the Theatre for Children with the impresario Fernando Porreddn—a project intended to promote quality plays for children. Benavente’s presence on the Spanish stage was almost constant for over half a century. Until his death in 1954, he produced at least two or three new plays a year, and often four or five. He wrote sketches for puppet shows, and in some cases he was also the puppeteer. He also wrote plays such as Earning a Living (1909) and the best known of his children’s plays, The Prince Who Learned Everything from Books, which also premiered in 1909. Highest Accolades. Benavente’s contributions to Spanish theater were awarded not only immense popularity in his lifetime but also public recognition and official honors. In 1912 he was elected to the Spanish Royal Academy. In 1920 he was named director of the Spanish National Theatre. In 1922 he received the Nobel Prize for Literature, becoming the second Spaniard to receive the honor. Benavente could not attend the Nobel award ceremony because he was in Argentina at that time participating in a theatrical tour, an opportunity he had welcomed in order to cope with his grief over his mother’s death earlier that year. He also visited Mexico, Cuba, and the United States, receiving more honors along the way, and upon his return to Spain, he received the Great Cross of King Alfonso the Wise. The city council of Madrid named him Favorite Son of the city in 1924. Blacklisted. The Spanish Civil War (1936-1939), in which the ultranationalist forces of General Francisco Franco overthrew the Spanish Republic and established a military dictatorship, changed the artistic climate in Spain dramatically. Benavente’s third and last transatlantic tour took place in 1945 under precarious circumstances, when he was in his late seventies. That year, he went to Argentina and premiered his last rural drama, The Noble Woman, in Buenos Aires. In 1947 he resumed his contributions to Madrid’s conservative newspaper ABC. In one of his first articles in this period, ‘‘Taking Dictation,’’ he defended Marshal Phillipe Petain, the disgraced French military leader who had been imprisoned for treason in 1945 for cooperating with the Vichy government duringWorldWarII.In was a clear attempt to stay in the good graces of Franco, Spain’s dictator. The article had a considerable impact in Spain. In 1948 it won him the coveted Mariano de Cavia Prize in journalism. But Benavente’s attempts to ingratiate himselfwith the Franco regime were deemed insincere. Because of his reputation as a liberal and his initial endorsement of the Spanish Republic, he was blacklisted by Franco’s government. His name could not appear in the Spanish press, which was controlled by rigid government censors. He had to be referred to in theatrical reviews as ‘‘the author of The Passion Flower’ Even the ads and the playbills for his plays could not use his name. Despite the problems with censorship, however, Benavente's plays were not banned, and the Spanish public continued to hold him in high esteem. When he died in Madrid on July 14, 1954, at age eighty-seven, he was still active on the Spanish stage. Wassily Kandinsky (1866-1944): Russian printmaker, painter, and art theorist, he is considered the founder of the abstract painting movement. H. G. Wells (1866-1946): English novelist and nonfiction writer, Wells was one of the foremost science fiction writers in history and one of the first to write on the theme of time travel. Laura Ingalls Wilder (1867-1957): An American author who was a popular writer of children's books. Her best- known work from her pioneer series is Little House on the Prairie (1935). William Butler Yeats (1865-1939): Irish poet and playwright, Yeats was a leading modernist literary figure, cofounding the Abbey Theatre and spearheading the Irish Literary Revival. Classic Influences. Benavente typically sought his models outside the traditional Spanish stage, and was influenced not only by contemporary European playwrights, but also by the comedy of manners and the works of Moliere and Shakespeare. The Favorites (1903), for example, is based on Shakespeare's play Much Ado About Nothing (c. 1598-1599). His fascination for the circus world is reflected in the settings of several plays, such as Saturday Night (1903) and Brute Force (1919). The main characters and plot of such works as The Bonds of Interest (1907), however, are inspired by the tradition of Spanish classic literature. Crispin, the central character, recalls the figure of the picaro or rogue of the Spanish golden age novel; the archetypical friendship of the idealistic Leandro and the commonsensical Crispin also evokes that of Don Quixote and Sancho Panza of Cervantes’s Don Quixote (1605). Modernized Style. Benavente is credited with introducing European modernist trends into the Spanish theater. His later plays anticipate the advent of naturalist theater in Spain. Critics have pointed out innovative aspects in early plays such as Another’s Nest (1894), for example, with its use of prose instead of verse, effective dialogue, the predominance of dramatic tension over action, the development of the characters’ psychological complexity, the lack of violence and outbursts of passion, and the realistic tone that prevails. Crime and Punishment (1866), a novel by Fyodor Dostoyevsky. This novel of good and evil and moral dilemmas focuses on a murderer who eventually atones for his sins. Manservant and Maidservant (1947), a novel by Ivy Compton-Burnett. In this novel, English author Compton-Burnett examines the lives of English servants, poking mocking fun at the upper classes they serve. Of Mice and Men (1937), a novel by John Steinbeck. This book explores mental and social disability, and society's insensitivity toward the handicapped. For a large part of the twentieth century, Benavente was simultaneously the most revered and the most criticized playwright in Spain. He had great success with the Spanish public in commercial theaters and inspired many imitators; but despite his popularity and influence, a large group of respected intellectuals and critics maintained negative assessments about his plays and his impact on contemporary Spanish theater. These critics, including Ramon Perez de Ayala, considered Benavente’s work outdated and unworthy of praise. Perez de Ayala later changed his view, but other critics still blamed Benavente for the perceived crisis of Spanish theater. They believed that he was too complacent because of his success with the Spanish middle-class public. The Bonds of Interest. Nevertheless, some works have sustained critical and popular interest, such as The Bonds of Interest (1907). Francisco Ruiz Ramon, one of the most influential historians of contemporary Spanish drama, considers The Bonds of Interest one of the masterpieces of twentieth-century Spanish theater. It is one of the few plays by Benavente that is still staged in Spain, and it has gone through many permutations. The public and critics of the time reacted with enthusiasm when it was premiered, and theater scholars have always praised it highly. The Spanish Royal Academy awarded it the Piquer Award in 1912. In a 1930 poll, fifty thousand people chose it as the best comedy by Benavente. 1. Some of the characters of The Bonds of Interest (1907) are inspired in the tradition of the Italian commedia dell’arte, improvisational theater, as stated in the prologue. Commedia dell’arte was performed primarily through the sixteenth, seventeenth, and eighteenth centuries in Italy and consisted of unscripted plays, outdoor performances, and very few props. Investigate further the practice of commedia dell’arte in Italy and explain how it influenced Benavente’s style. Find examples from one or more of his plays. 2. Benavente has been termed a feminist for his excellent presentation of female characters who usually have more moral substance than their male counterparts. In Another’s Nest, for instance, Benavente denounces the oppressive situation of married women in Spanish society. Look into feminism in Spain. When did people begin to acknowledge women’s equality? How is the movement reflected in Benavente? That is, how is female sexuality and behavior depicted and how is the depiction ‘‘feminist’’? 3. Benavente had at one time a reputation as a liberal, though his initial endorsement of the Spanish republic was later retracted. Research the Spanish republic of the period to understand what it meant to be a loyalist. Then consider an extended biography of Benavente and come to a conclusion about what it meant for the playwright to switch loyalties—moving as he did from being in favor of the Spanish republic to making an apology for Franco’s government, a former ally of the Axis Powers. What was the impact of his political shift? How did it hurt his writing career? Calvo, Javier Huerta, and Emilio Peral Vega. ‘‘Benavente and Other Authors.’’ In The History of Spanish Theatre. Vol. 2. Edited by Fernando Domenech Rico and Emilio Peral Vega. Madrid: Gredos, 2003. Galan, Eduardo. ‘‘Jacinto Benavente and the Bourgeois Drama.’’ In Eduardo Galan et al. Theatre and Thought in the Generacion of 98. Madrid: Fundacicrn Pro-RESAD, 1998. Penuelas, Marcelino C. Jacinto Benavente. Boston: Twayne, 1968. Perez de Ayala, Ramdn.Darkness at the Summits. Madrid: Editorial Castalia, 1907. Ramon, Francisco Ruiz. History of Spanish Theatre. Vol. 20. 4th ed. Madrid: Catedra, 1980. Starkie, Walter. Jacinto Benavente. London: Oxford University Press, 1924. Books and Writers. Jacinto Benavente (1866-1954)—Jacinto Benavente y Martinez. Retrieved May 28, 2008, from http://www.kirjasto.sci.fi/benavent.htm. The Columbia Encyclopedia, 6th Edition. ‘‘Benavente y Martinez, Jacinto.’’ Retrieved May 28, 2008, from http://www.bartleby.com/65/be/Benavent.html. The Nobel Foundation. The Nobel Prize for Literature 1922: Jacinto Benavente. Retrieved May 28, 2008, from http://nobelprize.org/nobel_prizes/literature/laureates/1922/index.html.